Join in the fun at the 57th Justice League™ Anniversary Party… just don’t tell Batman™! Place the needle on the records with Wonder Dog™ in the DJ booth. Go for a spin on the rotating dance floor with Superman™. Fly around the room with Hawkgirl™ and dance till you drop with El Dorado™ and Green Arrow™! 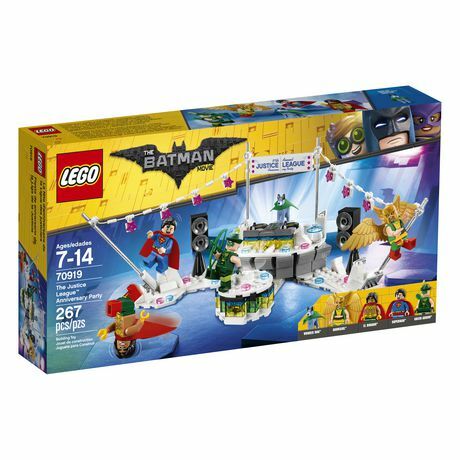 Includes 4 minifigures: Superman™, Hawkgirl™, El Dorado™ and Green Arrow™, plus a Wonder Dog™ figure. Features a wheel-operated, rotating dance floor for a minifigure, DJ booth with a flip-up seat for the Wonder Dog™ figure or space for a minifigure and detailed record decks with 2 turntables and adjustable record needles, ‘57th .